Abstract: Samsung have been pumping out optical drives lately, and today we're going to be taking a look at their latest SM-352 52x24x52x16 CD-RW/DVD combo drive. While working on my dad's home theatre SFF PC recently, I found out just how useful combo CD-ROM drives can really be. Because this computer was hooked up to an old 10-BaseT home Ethernet at my parents house which also has broadband internet access, my had dad downloaded a whole lot of stuff he wanted to burn. He likes to use the SFF PC on the 52" HDTV instead of his main PC, but this tiny computer didn't have room for both a DVD-ROM and CDR-RW burner. You can imagine that transferring Gigabytes worth of data over their old 10BaseT LAN is just not an option, and in the end I went out to buy a CD-RW/DVD combo drive so he could burn his data right then and there. Samsung has been pumping out quite a bit of value optical drives lately and today we're going to be taking a look at their latest SM-352 52x24x52x16 CD-RW/DVD combo drive. In terms of speed the Samsung SM-352 is in the fastest class for combo drives on the market. With an 8MB memory buffer and Samsung's 'Buffer Under Run Free' technology, the SM-352 pretty much guarantees error free burning. The SM-352 supports the usual DAO (Disc at Once), TAO (Track at Once), SAO (Session at Once) and Multi session Packet Writing (variable and Fixed) burning methods. The drive also supports CD-R types 74/80/90 (650MB/700MB/800MB) and CD-RW types 74/80. If you're reading CD's the drive supports up to Ultra DMA mode 2 (33MB/s transfers). Even though the natural position of the drive is horizontal, it can be used and mounted vertically thanks to the retention clips on the tray. The rear of the Samsung SM-352 looks exactly like all other optical devices, there is the molex power connector, IDE, Master/Slave/CS jumper, analog and digital audio headers. 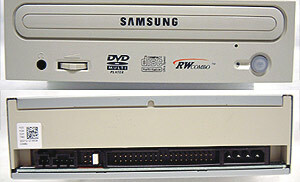 The SM-352 CD-RW/DVD combo drive scores in the middle of the pack here in CD Winbench 99. Performance is good, but not quite up to the speeds registered with the MSI CR52A-A2.